Paris St Germain’s only signing of January transfer deadline day 2012 turned out to be Inter Milan’s elegant midfielder Thiago Motta. Costing the PSG an estimated €10million, Motta brings with him experience by the bucket-load, having served time at some of Europe’s top clubs. Born in Brazil, the 29-year-old started his career at Juventus, an appropriate club given his Italian lineage (more of which later). Interestingly enough, his new team-mate Alex is also a graduate of the Juve youth system, they’ve probably got friends in common on Facebook. But Motty didn’t hang around long, soon attracting the interest of Barcelona, who snapped him up in 1999 when he was just 17. After a couple of years mooching around in the B team, Motta got his chance with the Barca big-boys in 2001/02, making his debut in a 3-0 win over Mallorca. That year he went on to make a none-too-shabby 25 appearances for Charly Rexach’s side. The fact that he only managed another 71 in the following five years is perhaps testament not only to the strength of Barca’s midfield, but also to the injury problems which have dogged Motta during his career. Motta first came to the attention of football fans in the UK when he was sent off for a tunnel clash with Celtic keeper Rab Douglas in a UEFA cup tie in March 2004. Trying to protect yourself using other people, I’m sure we’ve all been there. I should say that Motta has regularly been linked with a move to these shores throughout his career, but has never made it for whatever reason. My googling has discovered stories suggesting he was at various times about to join Man City, Man Utd, Arsenal, Spurs, Liverpool, West Ham, and Middlesbrough. Motta stayed at Barca until the summer of 2007, when he made the move to Atletico Madrid for an undisclosed fee. He went with a parting shot aimed the Catalan club’s hierarchy; "I needed a change. I wanted to play with continuity and it was very difficult for me last season. Txiki (Begiristain) and the president (Joan Laporta) didn't treat me well, but I have no problem with [manager] Frank Rijkaard, who always spoke to me face-to-face. Anyway, I want to leave that all behind." It’s often said that a change is as good as a rest, but that wasn’t the case for Motta. He’d spent seven months out of action in 2005 after having reconstructive surgery on his knee, and by September 2007 a similar injury picked up in training had sidelined him once more. He returned to the team but in February went under the knife of renowned American knee surgeon Richard Steadman. Atleti made him available on a free transfer in summer 2008, and this alerted Harry Redknapp, who loves a slightly-soiled foreign free transfer almost as much as he loves a slightly soiled pound-note (allegedly). Redknapp was at the time in charge of Portsmouth, but after taking Motta on trial a deal was never struck. The Brazilian also interested Everton, but ended up on his way to Italy, joining Genoa on a free transfer. At this stage Motta’s career looked like drifting to a fairly mediocre conclusion; just another injury-prone player who had failed to live up to his early promise. But little did we know he was about to blossom at Genoa, making 27 appearances and netting a career best six goals, while also providing the bullets for another erstwhile PSG target, Diego Milito. 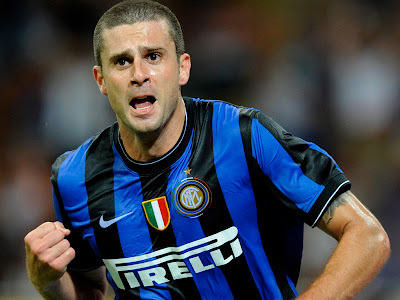 Alas for Genoa, world class players are always going attract the attention of world-class teams, and Inter Milan soon came calling for both Motta and Milito, agreeing a crazy swap deal which saw five unwanted Inter players heading the other way. It must do wonders for your self-esteem to know that you’re worth two and a half normal men. It was at around this time that the midfielder first expressed an interest in playing for the Azzuri. Despite being born in Brazil, and having represented their national team up to under-23 level, Motta said he had his heart set on representing Italy, the land of his grandfather: “I have Italian blood, I feel Italian and I only ask to be considered as an option for a place with the Azzurri,” he said. “I have always had the passport, even before arriving in Europe (…) I never thought I could be part of the Selecao. Of course I always wanted to wear the shirt of Brazil as a child, but now things have changed." The call-up finally came last year when Motta was named in Cesare Prandelli’s squad for a friendly against Germany. He required FIFA clearance due to his previous with the Brazilian national side, but having been given the all-clear he made his debut as a second half substitute. He went on to net the winner on his second appearance, a 1-0 Euro 2012 qualifying win in Slovenia, and injuries permitting it seems likely he’ll be at the tournament in Poland and Ukraine this summer. Rewinding slightly, Motta’s first season at Inter got off to a good start as he netted a goal in a 4-0 win over rivals AC Milan. Jose Mourinho’s side were pretty irresistible in 2009/10, winning the league, the Coppa Italia and the Champions League, with Milito scoring twice in the win over Bayern Munich in the final. Sadly for Motta he wasn’t involved, having been sent off in the semi-final against his former club Barcelona after allegedly striking Sergio Busquets in the face. Replays showed that, surprise surprise, Busquets might have made a little bit more of the incident than was strictly necessary; "He always does it,” said Motta. “I have seen it on TV and he is holding his face and then looking at the referee - it is terrible behaviour." Since then he has remained an important player for Inter, despite suffering what Zonal Marking’s Michael Cox described to me as a “classic post-Mourinho dip”, he has remained a key player for Inter, as is evidenced by Claudio Ranieri’s desire to keep him at the San Siro. Motta’s main strength is that he’s a good all-rounder; strong in the tackle but with a cool head on the ball and a good range of passing. In theory he’s a perfect fit for the middle tier of Carlo Ancelotti’s Christmas tree, and at 29 he should have a few good years left in him if he can stay out of the treatment room. Let’s hope this new challenge will bring the best out of him. Youssef Msakni smurfing into PSG? Ancelotti's PSG: Substance but no style? PSG Tourist. Powered by Blogger.